This blog will discuss the difference between server.transfer and response.redirect. So when to use “Server.Transfer” and when to use “Response.Redirect” ? What is importance of “preserveForm” flag in “Server.Transfer”? In ASP.NET, some of the concepts do the same task but are meant to be used in different scenarios. 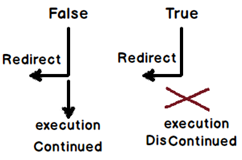 One such concept which is confusing and most discussed among developers is the difference between “Server.Transfer” and “Response.Redirect”. “response.redirect” and “server.transfer” helps to transfer user from one page to other page while the page is executing. But the way they do this transfer / redirect is very different. In this short blog, we will discuss how they differ and in which scenarios we should use them. In case you are a visual person and would like see a demonstration rather than theory, I would suggest to see the below Facebook video which explains the difference in a more demonstrative way. The main difference between them is who does the transfer. In “response.redirect”, the transfer is done by the browser while in “server.transfer”, it’s done by the server. Let us try to understand this statement in a more detailed manner. User sends a request to an ASP.NET page. In the below figure, the request is sent to “WebForm1” and we would like to navigate to “Webform2”. Server starts executing “Webform1” and the life cycle of the page starts. But before the complete life cycle of the page is completed, “Server.transfer” happens to “WebForm2”. 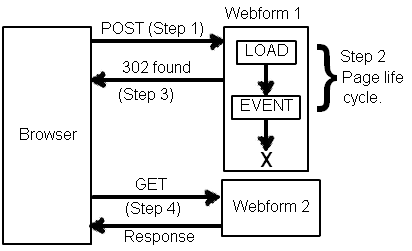 “Webform2” page object is created, full page life cycle is executed and output HTML response is then sent to the browser. One important point to note here is the URL is not changed to the target page. If you have sent request from “Webform1.aspx” to redirect to “WebForm2.aspx” on the browser URL, you will still see “WebForm1.aspx”. Client (browser) sends a request to a page. In the below figure, the request is sent to “WebForm1” and we would like to navigate to “Webform2”. Life cycle of “Webform1” starts executing. But in between the life cycle “Response.Redirect” happens. Now rather than server doing a redirect, he sends a HTTP 302 command to the browser. This command tells the browser that he has to initiate a GET request to “Webform2.aspx” page. Browser interprets the 302 command and sends a GET request for “Webform2.aspx”. In this case, you will see the URLs are changed as per redirection. 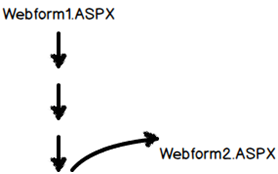 So if you have redirected to “Webform2.aspx”, then on the browser URL, you should see “WebForm2.aspx”. In other words, “Server.Transfer” is executed by the server while “Response.Redirect” is executed by the browser. “Response.Redirect” needs two requests to do a redirect of the page. So When to Use “Server.Transfer” and When to Use “Response.Redirect”? Use “Server.Transfer” when you want to navigate pages which reside on the same server, use “Response.Redirect” when you want to navigate between pages which resides on different server and domain. Below goes the consolidated table with all the differences as discussed at the top. Redirection Redirection is done by the server. Redirection is done by the browser client. Browser URL Does not change. Changes to the redirected target page. When to use Redirect between pages of the same server. Redirect between pages on different server and domain. What is the Importance of “preserveForm” Flag in “Server.Transfer”? 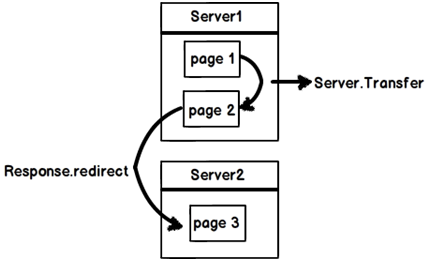 “Server.Transfer” helps to redirect from one page to other page. If you wish to pass query string and form data of the first page to the target page during this redirection, you need to set “preserveForm” to “true” as shown in the below code. By default, the value of “preserveForm” is “true”. Response.Redirect(URL,false): Client is redirected to a new page and the current page on the server will keep processing ahead. Response.Redirect(URL,true): Client is redirected to a new page but the processing of the current page is aborted. Below is a Facebook video which demonstrates practically the difference between server.transfervsresponse.redirect. A big thanks to www.questpond.com to allow me to publish this videos for free on Facebook. Pretty decent explanations along with the application of the concepts. I use Ajax AutoCompleteExtender in my aspx pages, with VB NET. So, if you move from page A to page B using SERVER.TRANSFER then AutoCompleteExtender won't run until first postback; if you use RESPONSE.REDIRECT instead of SERVER.TRASFER then AutoCompleteExtender will run fine. How the concept of server.transfer work in case of ASP.net MVC? I have a LinkButton which executes a method, and within this method will charge the value of the LinkButton PostBackUrl which is the address of a file to download. Upon completion of this method I do a Response.Redirect (lnkDescargarFormaObjecion.PostBackUrl); and I actually download archvio, but I closed the session of all users who are currently working in the application. Very clear and good explanation. One little thing, I'd rather use "it" than "he" for non human things like servers and browsers. I wonder if my browser is male or female.